Yuriko Yamaguchi’s ethereal sculptures are mostly made of wire and resin, but she has also included LED lights, wood, minerals, and bits of electronics. Reminiscent of organic shapes such as clouds, swarms, and neural networks, they symbolize the interconnectedness of all human and organic systems. Yamaguchi says that her work was influenced by the work of physicist and systems theorist Fritjof Capra, whose book “The Web of Life” explored the tension between the part and the whole in many different systems. The cloudlike form refers not only to atmospheric phenomena but to the modern, technological meaning of “the cloud”, emphasizing Yamaguchi’s belief that science, nature and technology are intimately intertwined. 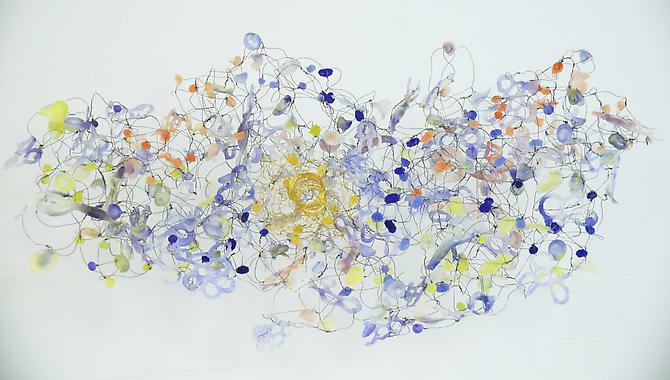 Several pieces of her recent work are on display in “Interconnected: Science, Nature, and Technologies” at the Adamson Gallery in Washington, DC through August 31. This entry was posted in The Art of Science and tagged Adamson Gallery, science art, technology art, Yuriko Yamaguchi. Bookmark the permalink. That looks so much like a protein structure, I just assumed it was one, until I read the description!